The western regions of Sichuan province, in some ways, can be likened to the American wild west of the late 19th century. The cowboy atmosphere of this Tibetan stronghold expanse still permeates the air, as if some invisible time bubble is shielding the region from the rest of the globe. For those that travel in this location, the encounters are still very raw, as the areas remain largely untouched by tourism. This is how to experience Tibet without actually going there. This unique itinerary provides some very real experiences in this forgotten world between Tibet itself and the rest of China. 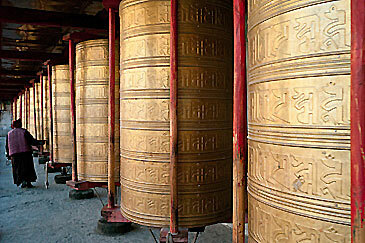 •	Visit an atmospheric and secluded monastery on the edge of the Tibetan highlands. •	Experience the high vast grasslands backdropped by the cathedral like Yala Holy Mountain in the heavily Tibetan area around Tagong. 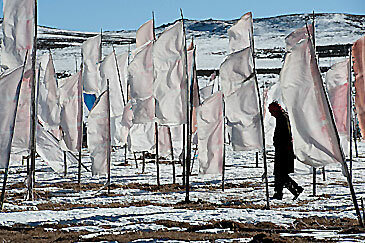 •	Visit the winter homes of semi nomadic Tibetans in the grasslands near Tagong. •	Drive along the high open road from Kangding all the way to the north face of Yalashan and then follow a beautiful river valley to Danba and on to the Four Sisters National Park. •	Take a horseback ride up a ridgeline in the Four Sisters National Park for incredible views of the highest peak. •	Tutorials conducted on composition, light, landscape, architecture, and portrait photography. 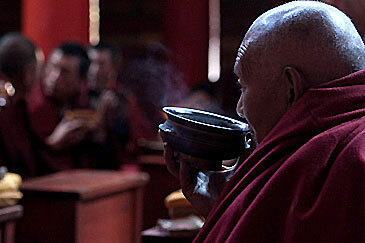 •	Photograph monks during a prayer session and work with them directly to create your very own special portraits. • Interact with and photograph the life of the semi nomadic Tibetans in and around their winter homes out on the grasslands. •	Enjoy great landscape photography in the Four Sisters National Park. •	Guidance and instant feedback from Ron while photographing out in the field. •	Present your favourite shots of the trip to the group at a ‘show and tell session’. You will arrive in Chengdu according to your own arrangements. We will pick you up at the airport and take you to complete the formalities for obtaining your Chinese driving license. If there is time, stroll around the centre of Chengdu and marvel at the pace of life here in one of China’s largest cities, before having dinner in a beautiful Sichuanese restaurant. Ron will conduct an optional technical photography class to help those unfamiliar with the most important functions on their camera. Concepts will be simplified into an easy to understand format and will form the base for the remaining presentations during the tour. Today you will visit the very lush Lugou Bamboo Sea forest quietly set along a meandering creek, before having lunch in the old town of Pingle. After lunch, we will drive along fantastic winding country roads to Ya’an, stopping en route to visit another old town, Shangli, formerly an important post of both the Silk Road and the ancient Tea Horse Trail. The contrast and shadowy definitions of the Lugou Bamboo Sea make it a perfect place to photograph and will allow you to test your new technical skills introduced on the previous day. Shangli affords plenty more photo opportunities with its charming old town architecture and riverside setting. In the evening, Ron will conduct a lecture on composition. Following the G318, China’s longest national road at over 5,000km in length, will take you to Kangding, the eastern border of Sichuan’s ethnically Tibetan Ganzi region. On the way you will stop for lunch at Luding. The Luding Bridge was a historical landmark secured by the Red Army during the Long March. After arriving in Kangding, and time permitting, we can either visit a monastery at the top of the town or head up to nearby Paomashan for views of the surrounding area. Today is mostly a travel day to get you to the heart of the trip, the beginning of the Tibetan highlands. If we arrive early enough in Kangding, there may be some interesting photo opportunities in the monastery or great views on Paomashan. After dinner, a class on taking portraits will be presented to prepare you for the visit to a beautiful monastery tomorrow. This day is packed with amazing scenery. We will first make a brief stop at a high pass above 4000 metres and then continue onto Xinduqiao where we’ll visit the Juli Tibetan buddhist monastery, fantastically secluded at the end of a short, quiet valley. 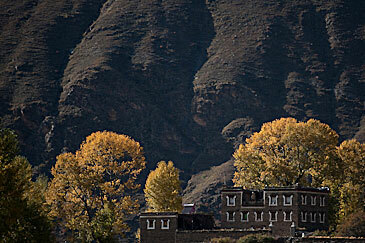 We will have a picnic lunch there, and then on the afternoon drive to Tagong, there will be plenty of stops among the Tibetan homes and orange larch trees. We’ll arrive in Tagong in time to catch the sunset. 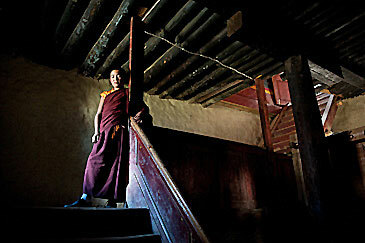 Photograph the monks at Juli monastery during a prayer session and then work with them after to create your own portraits. There will be opportunities to stop during the drive to capture the amazing landscapes and Tibetan homes, where the bright orange colours of the larch trees in the fall give a beautiful contrast. On our arrival in Tagong, photograph the grasslands and Yala Holy Mountain in the light of the setting sun. After dinner there will be a lecture on photographing landscapes and architecture. We will spend the entire day in the area around Tagong. Feel free to get up early to observe the pilgrims circumambulating and spinning the large prayer wheels around Tagong Monastery. 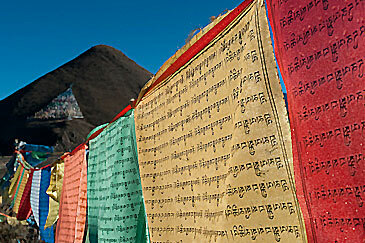 After breakfast we will take a short drive to where we can observe craftsmen carving Tibetan inscriptions on mani stones. Following lunch, we’ll then spend the afternoon visiting semi nomadic Tibetan families in their winter homes out on the grasslands and then wrap up the day with a casual drive around the area to see the fascinating landscape. Opportunities for capturing candid images of pilgrims in the morning light can lead to great photographs but please respect them as many prefer not to have their photograph taken. Please consider taking wider angle environmental style photos from further away. The many inscribed mani stones stacked at various angles and back dropped by prayer wheels are also excellent photography subjects. At the nomad winter homes, you can either take candid photographs, or set up your own shots in an around their atmospheric homes as our group has a specially arranged photo session with them. Today we will cross over a 4,000 metre high pass before descending along a river valley into Danba, where there are unique ancient stone watchtowers nearby. Traditional clothing changes here as we leave the Tibetan highlands. In the river valley there are interesting tower like homes in the many of the villages. After lunch in Danba, we will gradually ascend to the Four Sisters National Park. During the first part of the drive, there will be opportunities to photograph the colourful larch trees covering the hills. Once into the river valley, you may want to stop and capture some images of the tower homes as well as the stone watchtowers in Danba. In Rilong, Ron will discuss the specific landscape techniques that will apply to photographing in the national park tomorrow. In the morning we will take a shuttle bus up the Shuangqiao valley that is surrounded by high jagged edged peaks, and where we can make a number of stops to walk though the forests. For the afternoon, we will take a horse ride up Haizi valley to a beautiful ridge that allows a view of all of the Four Sisters mountains, the highest one reaching 6,300 metres. There are plenty of photo opportunities of the high snow capped mountain peaks and the forests and small lakes in the valley to test your landscape photography skills. On the horse ride along the ridge, try to include the horses and perhaps our guides themselves into the surrounding views of the Four Sisters mountains. If the weather is clear, we’ll drive up to a nearby viewpoint to see the Four Sisters in the morning light. We will then take a delightful back road that crosses another 4,000 metre high pass whose upper reaches may be blanketed with snow and at the top you may see eagles soaring just overhead. A long descent of 3,000 metres then takes us into a pleasant valley. Before reaching Baoxing, we will take a detour to follow a tiny dirt road up to a quaint, secluded nineteenth century Catholic church that was built by a French missionary who was the first Westerner to bring the Giant Panda to the attention of the world. Here we will enjoy a late picnic lunch in the quiet surroundings high up in the valley. The viewpoint of the Four Sisters can make for a dramatic landscape photo in the morning. There are fine vistas on the on way up the Jiajinshan pass and open views at the summit. The isolation and tranquil setting of the timber Catholic church makes for some relaxing photography. Since this will be our final evening of the journey, after dinner we will have a light hearted and enjoyable wrap up session where customers will choose their favourite photos and we will project them onto a large screen and Ron will provide some final comments and feedback. It will be a relatively straightforward drive back to Chengdu in the morning where those that are not staying on can catch their flight back home anytime from mid-afternoon onward.